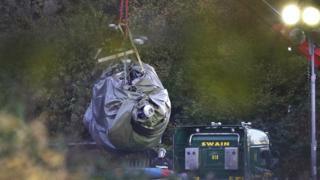 The wreckage of the helicopter which crashed near to Leicester City's stadium has been removed. Club owner Vichai Srivaddhanaprabha's body has also arrived in Thailand ahead of his funeral. The Air Accidents Investigation Branch (AAIB) has begun examining parts of the wreckage and the in-flight recorder. Mr Vichai died with two members of his staff, the pilot and a passenger when the aircraft came down near the King Power Stadium on Saturday. An AAIB spokesman said the wreckage had arrived at its specialist facility in Farnborough and inspectors gathered all the evidence that could be collected from the scene. The wreckage will be "laid out and more detailed examination can continue", he said. "Our inspectors are verifying the extracted information and have started the detailed analysis of its contents," the spokesman added. A black vehicle, thought to be carrying Mr Vichai's body, was seen travelling from Don Mueang airport to the temple where the funeral is scheduled to take place on Saturday. Nusara Suknamai, Kaveporn Punpare, and pilots and partners Eric Swaffer and Izabela Roza Lechowicz also died in the crash last Saturday. Police added the coroner has now formally identified all five of the victims. Leicester City are due to play Cardiff on Saturday, which will be their first game since the crash. They were due to play Southampton in the Carabao Cup on Tuesday, but the match was rescheduled. The club has confirmed that some players and staff will be flying out to Thailand after Saturday's game. In a press conference on Thursday, Leicester manager Claude Puel said the result at the Cardiff game was "not important". He added that Leicester goalkeeper Kasper Schmeichel, named as one of the first people on the scene after the helicopter crashed, "saw a lot of things". An eyewitness saw Schmeichel run out from the stadium on Saturday night followed by "loads of security guards and stewards". Puel said: "Kasper, like the other players, has a lot of history with the chairman and they are all devastated." 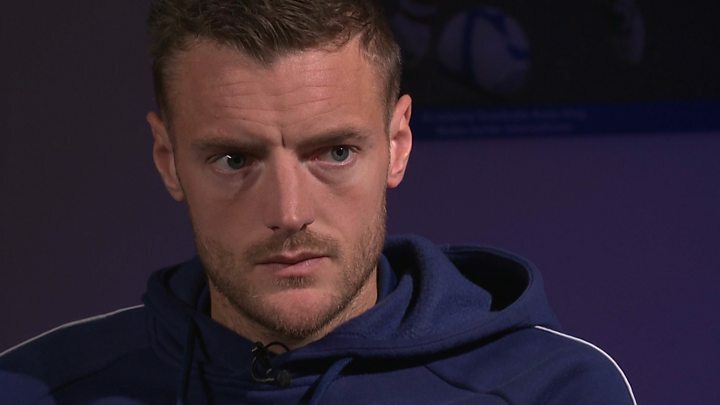 Ahead of Saturday's game, Leicester striker Jamie Vardy told Sky Sports: "For us as players, we want to get a positive result." The 31-year-old added: "We need to make sure we go out there and honour his name and put in a performance that will hopefully get the win. "We all spoke about wanting to play. It's what Vichai would have wanted and that's what we are going to do." On flying to Thailand for the funeral, he said: "It's been the hardest week of everyone's lives. "It'll be massively important we attend. We are a close-knit group and one big family and one of the main reasons for that is Vichai - so it's massively important. "He wasn't just a chairman, he literally was part of your extended family." The night before he died, pilot Mr Swaffer emailed a carpet company requesting a blue runner for the helicopter. The firm's managing director Myles Shaw said it had now been personalised with the Leicester City logo and was being sent to the club. "It was something we needed to do," Mr Shaw added.